L-R: Gabrielle Baker, Erica Ferreira, and Savannah Mannes representing the American Student Rider Organization and Team USA. 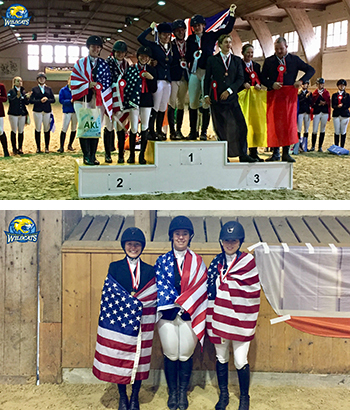 Cazenovia College Equestrian team (CCET) members Gabrielle Baker, Savannah Mannes, and Erica Ferreira represented the Student Rider Nation's Cup (SRNC) from October 20-22 in Bern, Switzerland. The Wildcats trio and Team USA captured the Silver Medal (2nd Place) in Show Jumping while finishing 13th in Dressage. Their efforts gave Team USA a 7th place finish overall. Individually Wildcats junior Gabby Baker finished 3rd in Show Jumping and 12th overall. Senior Savannah Mannes finished between 7-12th in Show Jumping. "It's very different than regular intercollegiate riding competitions," said Cazenovia College Head Equestrian Coach Amy Sherrick-von Schiller. "They worked hard to get there, each taking extra lessons in the weeks leading up to the competition. They represented the College very well, way to go Team USA!" Fourteen countries competed for the Student Rider Nations Cup in Switzerland last week including entries from Austria, Belgium, Estonia, Finland, France, Germany, Ireland, Netherlands, Norway, Spain, Sweden, United Kingdom, United States, and the host country of Switzerland.